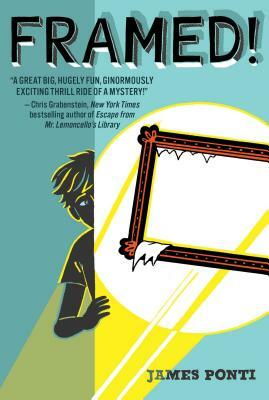 Get to know the only kid on the FBI Director’s speed dial and several international criminals’ most wanted lists all because of his Theory of All Small Things in this hilarious start to a brand-new middle grade mystery series. So you’re only halfway through your homework and the Director of the FBI keeps texting you for help…What do you do? Save your grade? Or save the country? If you’re Florian Bates, you figure out a way to do both. Florian is twelve years old and has just moved to Washington. He’s learning his way around using TOAST, which stands for the Theory of All Small Things. It’s a technique he invented to solve life’s little mysteries such as: where to sit on the on the first day of school, or which Chinese restaurant has the best eggrolls. But when he teaches it to his new friend Margaret, they uncover a mystery that isn’t little. In fact, it’s HUGE, and it involves the National Gallery, the FBI, and a notorious crime syndicate known as EEL. Can Florian decipher the clues and finish his homework in time to help the FBI solve the case? James Ponti was born in Italy, raised in Florida, and went to college in California. After receiving a degree in screenwriting from the USC Film School, he began a career writing and producing television shows for the likes of Nickelodeon, Disney Channel, PBS, Spike TV, History Channel, and Golf Channel. James loves writing, travel, and the Boston Red Sox. He lives with his family in Maitland, Florida. The real draws here are the two resourceful leads' solid,realistic friendship, bolstered by snappy dialogue, brisk pacing, andwell-crafted ancillary characters—not to mention behind-the-scenes glimpses ofthe FBI.More escapades are promised in this improbable but satisfying seriesstarter. Mystery buffs and fans of Anthony Horowitz’s “Alex Rider” series are in for a treat. . . . With elements of Alex Rider, James Bond, and Sherlock Holmes stories, this is likely to be popular with mystery and action/adventure fans. What stands out is the portrayal of Florian’s and Margaret’s intelligence, their close friendship, and athlete Margaret’s sports prowess. Refreshingly, the adults aren’t portrayed as completely clueless; they are respectful of the kids’ crime-solving abilities, even though the preteen sleuths, as they realize themselves, are not infallible. Young readers will enjoy this first caper in a projected series. Florian resembles a young Sherlock Holmes, and together he and Margaret use the TOAST technique to prove that things are not always as they first appear. This book will grab readers from the first page with its witty characters and non-stop action. It would be a great read for fans of Chasing Vermeer (Scholastic, 2005).